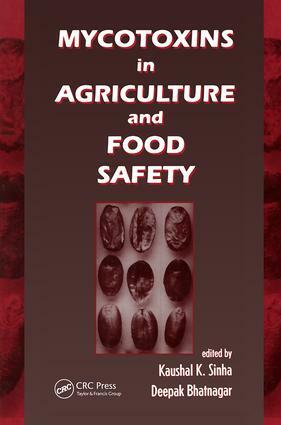 Describes a range of mycotoxins occurring as contaminants in agricultural crops and animal products, and details the implementation of food safety regulations via governmental and international agencies. The book charts the progress made in mycotoxicology since the early 1990s. It also profiles recent advances in mycotoxin analysis methods. "The book is well produced and the editors are to be congratulated in assembling an interesting team of well-informed authors. It should prove to be a useful reference book at all levels of interest in mycotoxins for some time to come." "The book is well produced and the editors are to be congratulated in assembling an interesting team of well-informed authors. It should prove to be a useful reference book at all levels of interest in mycotoxins for some time to come. " Part 1 Mycotoxins in food crops and analysis: mycotoxins in preharvest contamination of agricultural crops; distribution of fusarium species and their mycotoxins in cereal grains; toxigenic alternaria species of economic importance; the design of sampling plans for the determination of mycotoxins in foods and feeds; mycotoxin analytical techniques. Part 2 Toxicity of mycotoxins: determination of human exposure to aflatoxins; mechanistic interactions of mycotoxins - theoretical considerations. Part 3 Factors in mycotoxin formation: mycotoxin formation and environmental factors; process of contamination by aflotoxin-producing fungi and their impact on crops; the involvement of arthropods in the establishment of mycotoxigenic fungi under field conditions. Part 4 Management of mycotoxin contamination: recent advances in preharvest prevention of mycotoxin contaminants; detoxification of mycotoxins and food safety; effectiveness of postharvest procedures in management of mycotoxin hazards; mycotoxins - risk evaluation and management in radiation-processed foods. Part 5 Food safety regulation pertaining to mycotoxins: regulatory control programmes for mycotoxin-contaminated food; the role of national governments and international agencies in the risk analysis of mycotoxins.